Just a day and a half after arriving back home after my trip to Disneyland, I packed my bags again and headed on another exciting trip! I spent a week(ish) in one of my favourite cities in the world, London! I stayed for two nights with my three friends, Elena, Helen and Jenny then stayed an extra two nights once they left. London has so much to offer so I always try and make the most of my trips, which aren't as often as I'd like them to be! Of course, being the theatre nut I am, I spend the majority of my time (and money) in the West End in London. I took full advantage of this trip and went to see an impressive five shows in the four days I was there. Just hours after arriving in the city, we excitedly headed to the Garrick Theatre to watch Kenneth Branagh's production of Romeo and Juliet. This is my favourite Shakespeare play and we were thrilled at the heavily advertised star casting of Richard Madden and Lily James as the title roles. However, upon our arrival at the Garrick we found out the news that Richard Madden had a leg injury and would not be appearing as Romeo- his understudy Tom Hanson took his place. Admittedly we were gutted to miss Madden's hugely anticipated appearance as Romeo but Hanson proved a good understudy. Although if I'm honest, this whole show was very disappointing. Nothing about it stood out as particularly impressive to me and I felt the characters lacked in chemistry, it was as if they were literally just delivering the (obviously beautifully written) lines. The idea of setting this classic Shakespeare play in 1950s Verona intrigued me, but apart from the costumes of jeans and nightgowns/ trainers combos, this was completely dismissed and seemed unnecessary and underwhelming. I liked the idea of modernising parts of the play but random outbursts of electronica dance and booming music seemed very strange and broke the flow of the show. The only part of the show I really liked was Derek Jacobi's portrayal of Mercutio; his "Queen Mab" speech was full of energy and humour- one of the only parts of the show I felt like I wasn't waiting for the actor to finally finish speaking. He lit up the stage and added a real enjoyable aspect to the whole show, though I did question why they had chosen to cast a man so much older than Romeo himself. In conclusion, I was very underwhelmed by this highly anticipated show. I felt that it lacked in focus of its direction, there was little chemistry and I found the mumbling of many actors very off putting which is a shame! 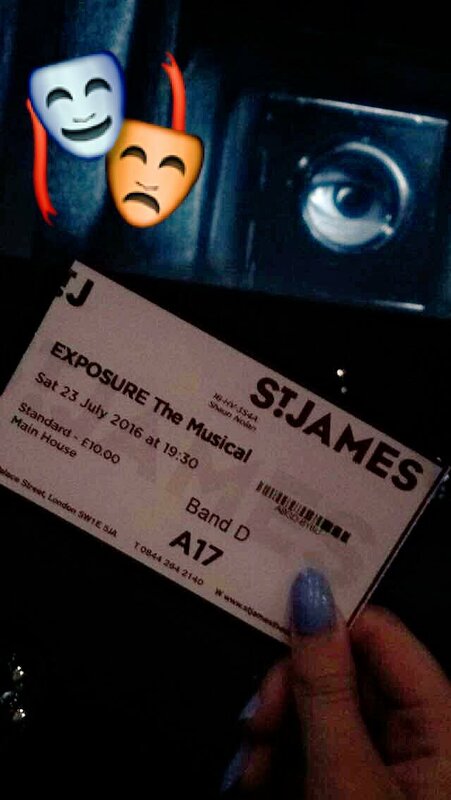 Being the most expensive tickets of the week (and worst seats), we all felt a little let down by this production. After a disappointing first show of the week, we knew it could only get better with a trip to my favourite theatre, Queens to see Les Miserables. Les Mis is, and will always be, one of my favourite musicals. Boublil and Schonberg's classic score never fails to give me goosebumps from the very first note- "BUM BUM DUMDUMDUMM"- and the legendary Cameron Mackintosh brings this beautiful story to life in his production. I love everything from the iconic barricade set, use of revolving turntable and costumes. This was my first time witnessing this year's new cast, with notable additions of Eva Noblezada as Eponine, Craig Mather as Marius, Chris Cowley as Enjorlas, David Langham as Thenardier as well as a brand new ensemble. The talent on that stage is outstanding and it seemed to me that every actor up there loved what they are doing and are proud of it, which is something that an audience member can definitely pick up on when watching this show. Despite the somewhat depressing death-filled storyline (which we all know and love), the energy and talent makes the whole show refreshing and uplifting. I will undoubtedly come back time and time again to see this iconic show. 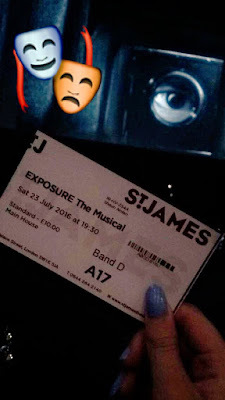 After a fun day with my theatre-loving friends, Shaun, Em and Meg, we ventured to St, James Theatre- a small space that I've been wanting to visit for a while now. We were all super intrigued at this new British musical after hearing that Getty Images and Canon are the leading producers of this photography- focused show. Why have the world's largest photography companies invested in producing a new piece of theatre? I think the only way to describe this show is completely bizarre. The story is baffling and its quite a lot to keep up with as new factors are being chucked into the mix all the time- it claims to capture the seedy business of celebrity exploitation through means of paparazzi but also focuses on the father-son relationship of the leads, a relationship with a homeless girl who makes angel decorations from coca--cola cans, power- hungry sinners and everything else in between. It is a wacky concept but the music to accompany the story was good, albeit not 'stuck in your head all day' good. As a collective, our favourite line had to be "looking through a belly button window" sung by a buff-looking Jimmy in tight boxers, playing a fetus- yes, it was that strange. I really enjoyed the energetic, slick choreography throughout and the talent of the actors on stage was undoubtedly so impressive that it made the entire experience enjoyable, even if it did leave us looking at each other saying "...what just happened...?!" Its nice to experience new writing in musical theatre, especially of British origin, as its something I personally don't get to experience very often in Plymouth so it was interesting and I'm glad I went! I recently saw the Guys and Dolls UK tour in Plymouth, and absolutely fell in love with it so I jumped at the opportunity to see the Chicester Festival production at the Phoenix Theatre with my lovely friend Tomi who I hadn't seen in three years!! It was the perfect way to catch up. Guys and Dolls is such a classic, with every song hitting the highest of standards (and will get stuck in your head for days afterwards). Its one of the best shows to put a smile on your face and walk out the theatre on a high. Everything from the songs, the costumes and the choreography is well thought- out and so impressive. The ensemble in particular stood out to me in this show, with talent and energy pouring from the stage- its totally infectious. I was looking forward to watching Hollywood star Rebel Wilson make her West End debut as Miss Adelaide. I've always enjoyed her comedic roles in big blockbuster films so I was intrigued to see her live on stage in a classic musical. She fit the role of Miss Adelaide really well, with perfect comedic timing and a naturally funny personality, she instantly won the audience over with her charm. She throws herself into her songs and dance routines throughout the show and shows great chemistry with the other characters. However I did have to question her dodgy accent which seemed to change every two seconds which was slightly off- putting. It seems a shame that Guys and Dolls has recently become 'The Rebel Wilson Show' through an obvious publicity push during the last months of its run, as the rest of the cast brings just as much to the stage, they seem overshadowed. Notable cast members include Gavin Spokes as Nicely Nicely who brings the house down with his rendition of the head- bopping, toe- tapping 'Sit Down Your Rocking The Boat' extravaganza, Simon Lipkin makes a perfect Nathan Detroit with his cheeky charm and impressive vocals, Siubhan Harrison as the sweet, fun-loving character of Sarah Brown and Jonathan Stewart who gave me goosebumps with his rendition of 'Luck To Be A Lady' as Sky Masterson. Its such a shame that this show is closing early as it really is a gem. Funnily enough, it was the last show of my hectic week that was my favourite by far. I ventured to Kings Cross theatre with a new friend from my university course to watch In The Heights. As a massive Lin Manuel Miranda fan, I was excited to finally see his first award- winning broadway musical. I managed to bag cheap £15 tickets for third row seats which was incredible. The staging is fantastic, with two platforms of seats surrounding the small stage which never feels crowded and you never feel like the actors have their backs to you. Its a totally immersive experience, especially being seated so close, the actors dance in the aisles and really interact with the audience without breaking the fourth wall which is very clever. The storyline is seemingly simple but its the explosion of energy through music, rap and dance that makes this show so special. Its latin beats are infectious, making all of the audience want to get up and dance. Paired with witty lyrics, perfect rapping and spine-tingling vocals, its everything I could want in a musical score. This whole show is just a breath of fresh air and is a totally feel- good production. I could probably gush about this one all day. The star of the show is without a doubt Sam Mackay who plays the lead, Usnavi. I was unsure of how I would find an Usnavi that isn't Lin Manuel Miranda himeself (who I've religiously watched on YouTube) but Sam is even more perfect for the role. He portrays Usnavi with such charisma and charm that you fall in love with him from the very first song. His rapping skills are some of the best I have ever witnessed and his interaction with other characters are tight and totally believable. Usnavi may be one of my new favourite musical theatre characters and that is largely down to Sam's perfect portayal. The rest of the cast were just as unbelievable: Dex Lee was the perfect 'cheeky chappy' with a romantic side in his portrayal of Benny, Sarah Naudi understudied Vanessa perfectly with ridiculously impressive vocals, Gabriela Garcia makes a great Nina, Cleve September makes an adorable Sonny and Philippa Stefani plays Daniela with so much sass its crazy. I haven't stopped listening to the songs on my Spotify playlist since leaving Kings Cross theatre and I'm already planning my next trip to see this show- I've completely fallen in love with it! Disclaimer: This trip was a personal leisure trip and all thoughts and opinions are my own. Great post, I love reading about everyone's theatre experiences. I've seen Romeo and Juliet (which I loved for pretty much the reasons you stated that you didn't like it, interestingly enough! ), In The Heights (SO good I saw it twice), and obviously who hasn't seen Les Mis? :D Wanted to catch Guys and Dolls but time is running out, so I'm going to have to settle with reading the reviews and imagining I think! Anway, great post!